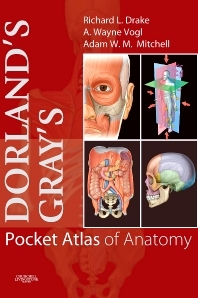 This new pocket atlas is your best way to reference anatomy on the go! It combines superb definitions from Dorland's Illustrated Medical Dictionary with phenomenal illustrations from Gray's Anatomy for Students, for an unprecedented level of accuracy and visual clarity. An organization by body region parallels the approach used by most of today's anatomy courses. Terms and descriptions are based on the Terminologia Anatomica, the most widely accepted anatomical nomenclature system. And, a bonus mini-CD in the back of the book lets you load Dorland's spell-checker software onto your computer. The result is an ideal guide to structures and their definitions . . . great for quick consultation in the dissection lab as well as for convenient study anytime, anywhere! An organization by body region, rather than by organ system, parallels the way most of today's anatomy courses approach the subject and facilitates quick reference. Exquisite full-color artwork from Gray's Anatomy for Students, as well as Standring: Gray's Anatomy, 39th Edition and Sobotta: Atlas of Human Anatomy, 14th Edition, makes structures easy to visualize, remember, and identify. Terms and descriptions based on Terminologia Anatomica ensure conformity with the most widely used and up-to-date international anatomical nomenclature system. Definitions from Dorland's Illustrated Medical Dictionary deliver clarity and accuracy from cover to cover. Dorland’s Spell Checker, included on a mini-CD in the back of the book, makes it simple to spell medical terms correctly on your computer. A truly pocket-sized format allows for portability and ease of use.